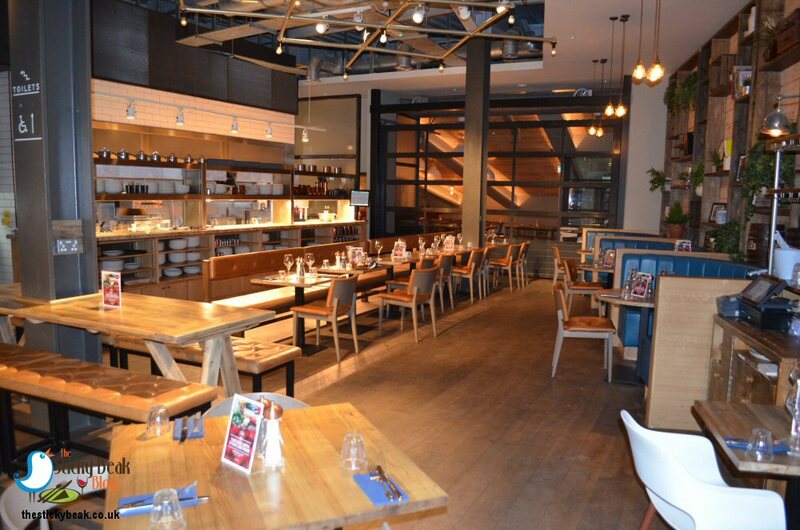 It was only last month that The Man and I were eating Sunday Lunch at Derby County Football Club’s restaurant, The Yard, but we were invited back to sample the new spring menu that launched on 14th January 2019. 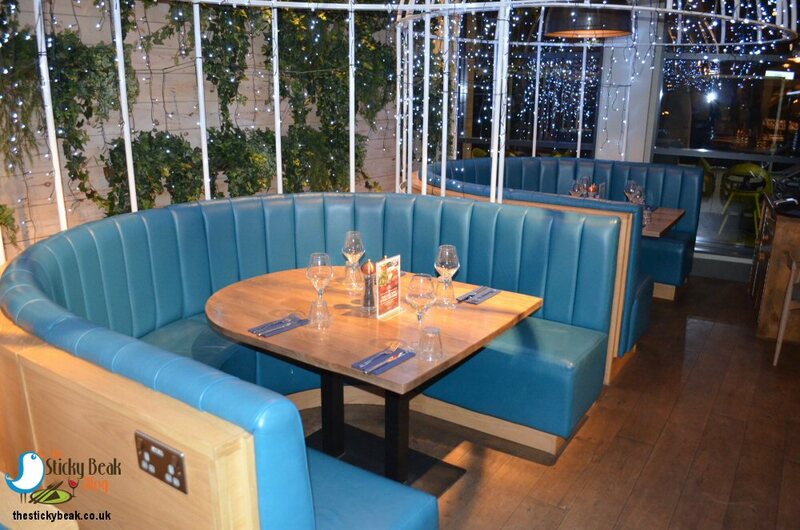 The Christmas tree and Fairy lights around the pillars had long gone, but the booth tables still had their fairy light canopies twinkling away. When we arrived there had been a conference of some sort happening, and the space was filled with chaps in suits enjoying a post-work drink. A family was tucking into an early dinner and there were a few more couples dining in too. The charming Toni (who normally works upstairs in the corporate area) was leading the team in The Yard, and soon got us settled at our booth table with a couple of drinks; Malbec for me, Peroni for His Nibs. 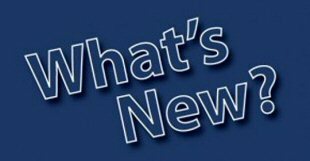 As we looked through the menu, I also spied the Valentines Evening promotion: 2 dine with Steak and Wine for £22.50 per person. 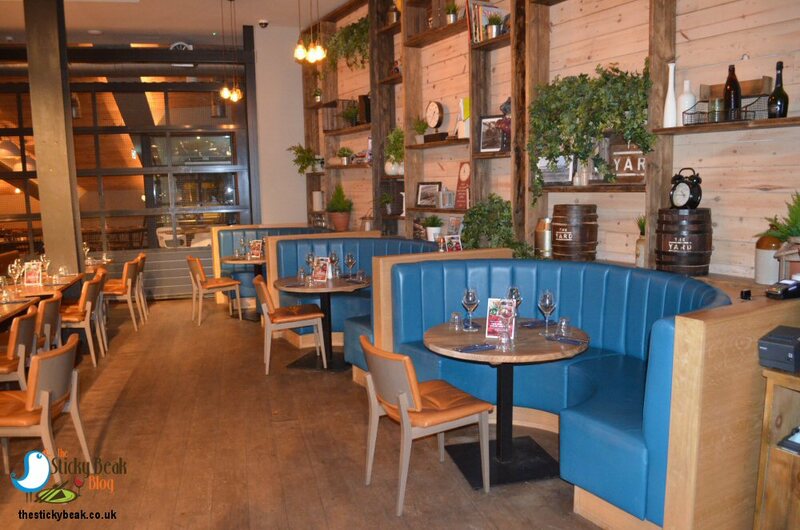 Any gents reading this who hadn’t given any thought to Valentine’s Day yet, you can thank me later (after you’ve rung The Yard and reserved a table, obvs!). There was a good selection of starter dishes to choose from, but I eventually settled on the Roasted Beets with Candied Walnuts, Pear Chutney and Sticky Honey dressing; Him Indoors opted for the Duck Pâté Lollipops with Plum compote, Spring Onions, and Radish salad. 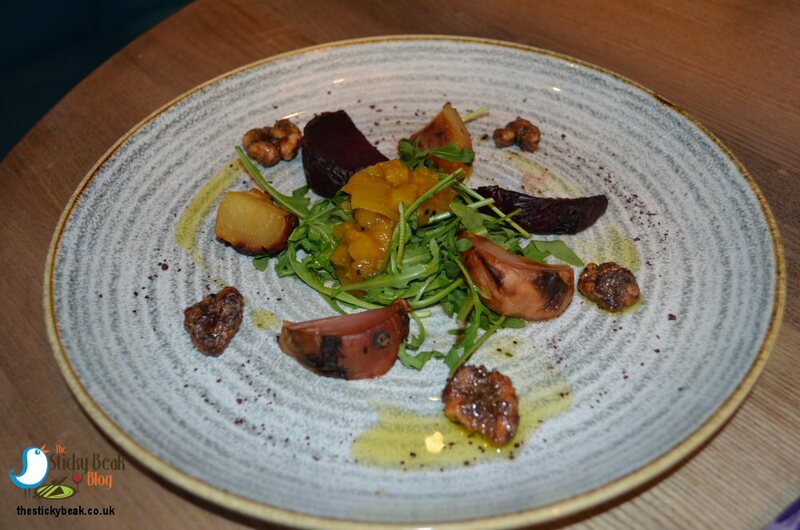 My plate was a riot of colour thanks to the variety of Beetroots on it; golden and traditional varieties of this incredible vegetable had been carefully arranged to maximise their visual appeal. The Beets had been cut into wedges and then roasted to gently soften them and release their earthy aroma, which was fair making my mouth water as I cut into them. A lovely crisp salad of verdant, peppery Rocket contrasted nicely in colour with the Beetroot too, as well as imparting a fab bright taste in the mouth. The candied Walnuts had a lovely sweet edge to them that complimented the deeper Beet taste and also gave some texture to the dish; the surprise element of the dish though was the Pear chutney. I was expecting the usual type of chutney, you know, sweet but savoury with a tinge of tang to it; instead I got a beautifully curry-esque version that brought out the Pear’s naturally fragrant taste really nicely. 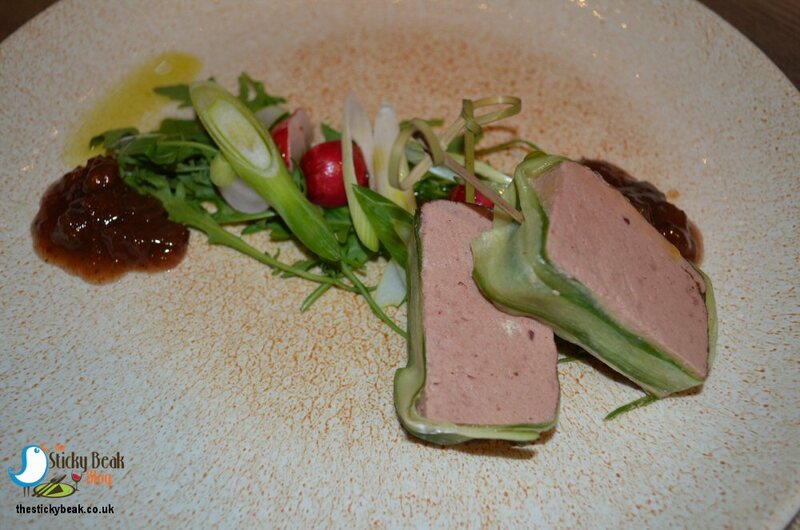 This was a superb starter, full of taste and textures - it didn’t lay heavy on the tum either. His Nibs’ Duck Pâté Lollipops were great to see; rectangles of the Duck Pâté had their edges covered with contrasting slivers of Cucumber and then the whole ensemble was popped onto a wood skewer. They really did look like savoury lollipops! The Pâté itself was glass smooth and wonderfully rich tasting; the Plum compote cut through it nicely with its aromatic spice notes so that it wasn’t cloying in the mouth. A gorgeously crunchy salad of Radish, Rocket and Spring Onion was zingy on the palate, which also elevated the fresh appeal of this dish in the mouth. 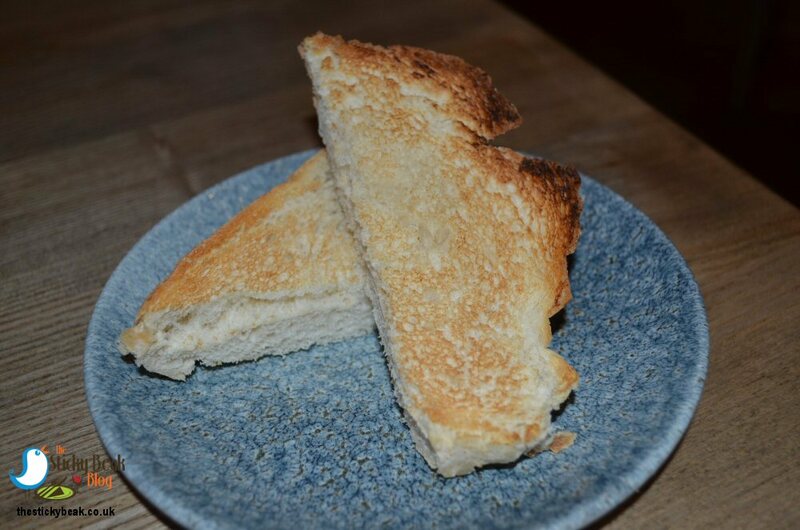 The final element of this starter was the fresh bread that had been cut into thick slices and warmed, allowing the pâté to soften as it came into contact with it. Toni was a very happy chap as he took back a pair of whistle clean plates to the kitchen. Thoughtfully, Toni had asked if we would like a little interlude before our mains were brought out -to which we replied “yes, please”. After 10 minutes or so, our main courses were winging their way over to us: Baked Marinated Cod with Courgette Lattice and Asian ‘Slaw for me, and Beef 3 Ways for The Boy Wonder. We also ordered sides of Onion rings and the Pomegranate super food Salad with 5 Beans to go with our second course. 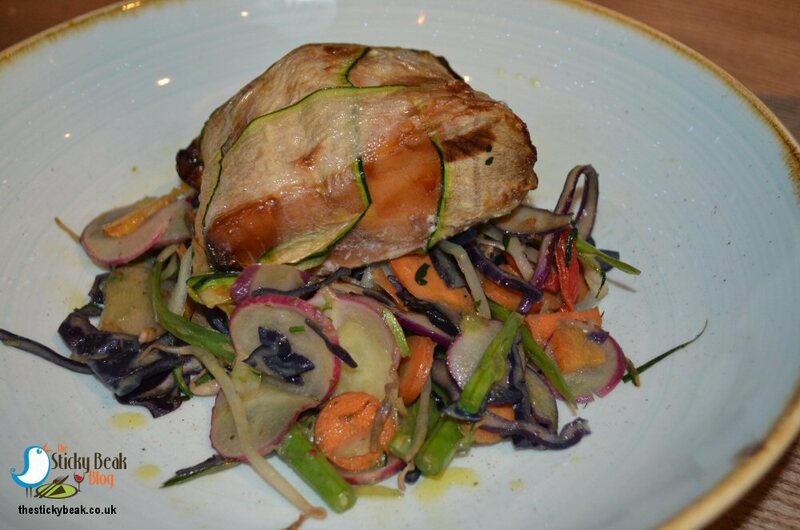 My piece of Cod was very generous in size and wrapped in a lattice network of gossamer fine Courgette slices. As I cut into the parcel I was rewarded with a puff of steam and that sweet, delicate scent of the marinated Cod. It was when I took my first bite though, that my true reward was revealed; I think that this is the best piece of fish that I’ve ever had the pleasure to eat, honestly. Sweet, succulent and nicely firm to the bite – my taste buds were in raptures. You all know that one of my pet peeves is dry, over-cooked fish so for me to heap such praise is rare, but it truly was deserved. Compliments to the Chef. I had another surprise in store for me with my choice of main. I had expected the Asian ‘Slaw to be cold, almost salad like; but no, it was a warm version. There were the usual coleslaw suspects of Red Cabbage, Carrot and Onion very much in evidence but these had been augmented by the inclusion of crispy Bean sprouts and julienned Green Beans. All had been gently warmed through and lightly dressed with an Asian influenced dressing. 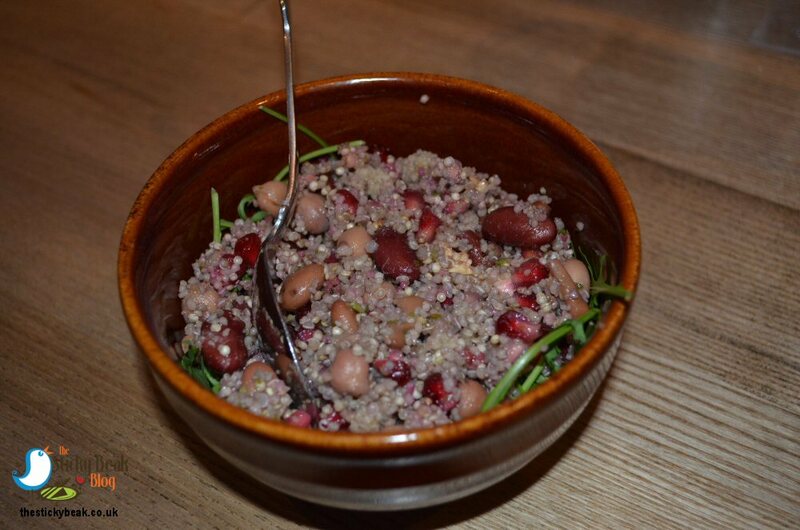 The Pomegranate and 5 Bean super salad was also delicious; nice, light and fresh on the palate with a fabulous crunch from the Pomegranate seeds. There was a deep bed of fresh Rocket leaves and Quinoa in this dish too, so plenty to munch away at with this accompaniment. 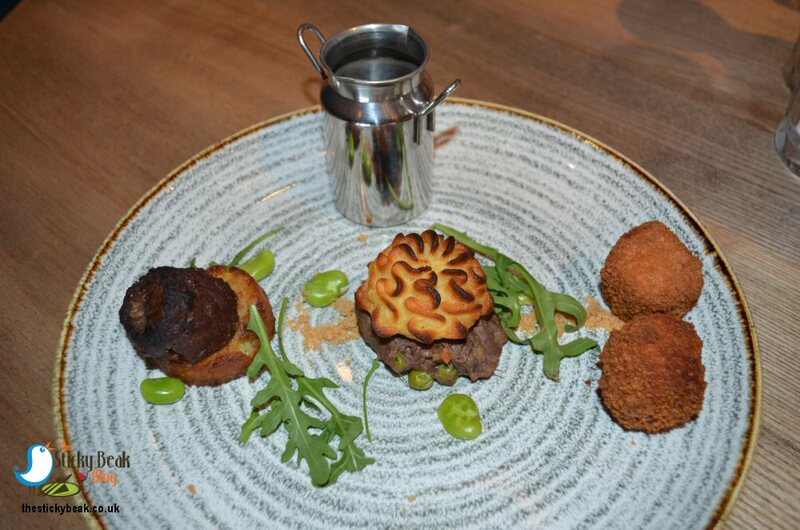 The Man Bird was also having a wonderful dining experience at The Yard as he tucked into his trio of Beef offerings: Croquettes, Cottage Pie and Blade of Beef. First up was the Croquettes, and these had a great dense texture, very much like a good solid meatball and were nicely seasoned. It didn’t take long for these beauties to disappear, as I’m sure you can imagine! Gorgeously sweet Baby Broad Beans made the perfect partner to the different interpretations of Beef and zippy Watercress kept the taste buds on high alert. Next in His Nibs’ sights was the mini Cottage Pie, and this had an incredibly rich flavour to it. Chunks of Beef were used rather than the minced version The Man was expecting and really hit the spot, appetite-wise. The Beef was topped with a delicately piped round of Potato that had been browned and crisped on the outside; when cut into this revealed kitten soft mash beneath. The final element of this dish was the braised Blade of Beef and this cut just has an incredible taste all of its own that is deep and rich and indulgent. No pressure at all was needed from The Man Birds’ cutlery as this cut fell away in ribbons as he touched it. The Potato Rosti that served as a bed for the Blade of Beef was also perfectly cooked; crisp outer, soft inner. 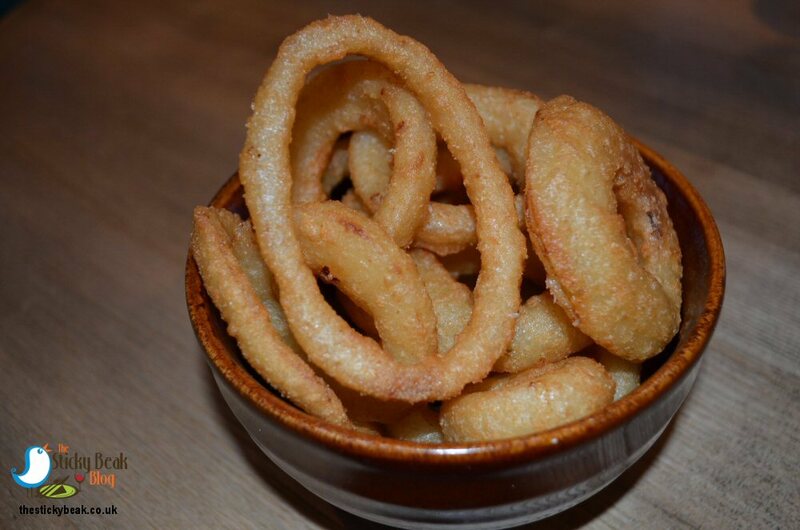 All that was left of our main course was the bowl of golden toned Onion rings – what would these be like? Blindingly good, as it turns out! They weren’t at all greasy and had a wonderful light, crisp batter encasing the thick slices of sweet onion. There was much discussion as to whether they were to be crowned best Onion Rings; not quite, but it was close as to whether they should have gone over the line. I wonder if they have a foodie version of VAR in development? Toni came to ask if our meals were to our liking and took the opportunity to refresh our jug of iced water – every time we’ve been to The Yard we’ve been asked if we’d like some water for the table. To my mind this should just be standard practice in any good establishment, but you’d be surprised how often it’s missing. Fresh slices of Lemon were also in the water, making it lovely and refreshing. 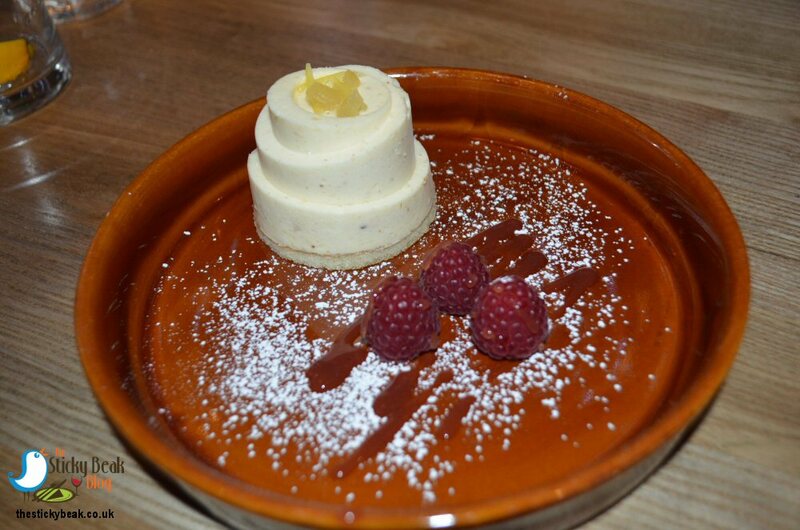 Talking of refreshing, our choice of puddings could both be described this way; for me it was the Lemongrass and Ginger Bavarois, His Nibs had the Raspberry Mousse with Pimms. My dessert had a thin base of plain sponge cake, upon which sat a firm dome of creamy deliciousness. The Bavarois was topped with pieces of preserved Ginger, and that superb heat danced on my tongue with gleeful abandon. The light sharpness of Lemongrass prevented the cream element from being heavy and claggy in the mouth, and both spices worked very well together. This was a superbly zingy dessert whose bright character made a great conclusion to my meal, and the fresh Raspberries only served to enhance this. It isn’t often that desserts claiming to have alcohol in them actually have the taste discernible; not the case with this little minx. 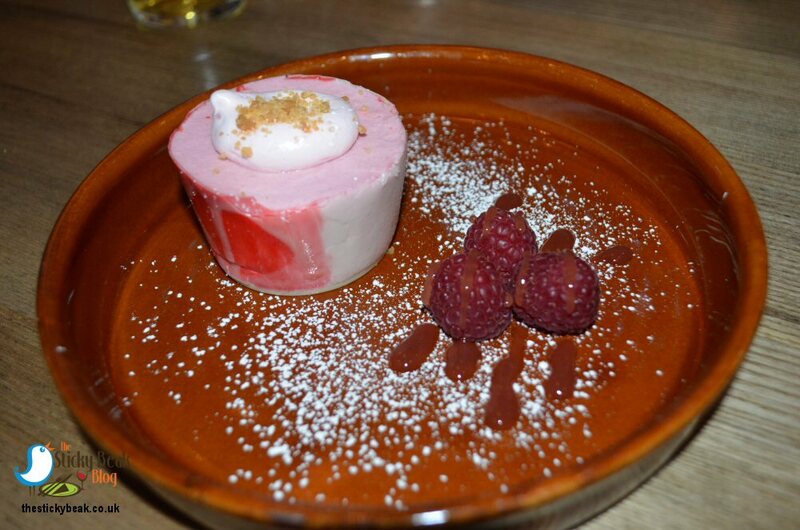 There was a definite hint of the Pimms on the palate which partnered the Raspberry in the mousse perfectly. The gorgeous Rose hued mousse was perched upon a disc of White Chocolate and fresh Raspberries were arranged carefully on the platter. The fresh fruit lifted the character of the pudding so that it again was a wonderful fresh morsel that ended the meal well and didn’t sit heavy on the tummy. Back of the Net a.k.a Hot Wings for Chef and his team at The Yard at D.C.F.C – Come On You Rams! !